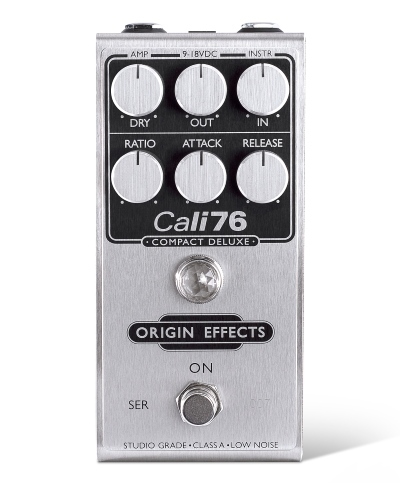 SMALLER SIZE WITH NO COMPROMISE The original Cali76 is a big, beautiful compressor pedal that delivers studio-quality 1176-style compression using discrete Class-A circuitry thats true to the topology and design philosophy of the original. Like all of our Compact Series pedals, the Cali76 Compact Deluxe features high-current, discrete, Class-A circuitry for transparent, low-noise performance. We've taken a no-compromise approach to the circuit design using only the best of modern components. Please note: the Cali76 Compact Deluxe is powered by a mains adaptor only. We've dispensed with the usual 9V battery option, both to save space and to allow us to adopt a high-current approach, yielding lower noise levels and superior tone.